Kompyte’s Organic Analysis highlights your complete SEO overview. First we focus on your rankings then we show you what the market is up to. We finish with a table showing your performance versus the market so you can strategically tackle your SEO action plan. The SEO Performance in the top bar shows your company’s organic performance on Google including a calculation of your Average SEO Position based on all the keywords you are tracking. The metrics in the top bar also include the Number of Keywords you are tracking in which you’re ranked in the top 10 positions, positions 11-100 and finally, positions greater than 100. 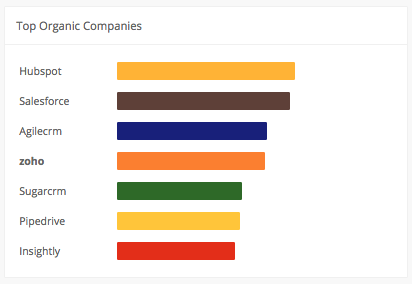 The Top Organic Companies chart reveals companies most closely matching your SEO Strategy. The chart shows companies ranking for the highest percentage of your keywords. For example if you are tracking 100 keywords and a company is ranking for 70 of those keywords, they might appear in the Top Organic Companies chart. Why are some companies in the Top Organic Companies chart grayed out? 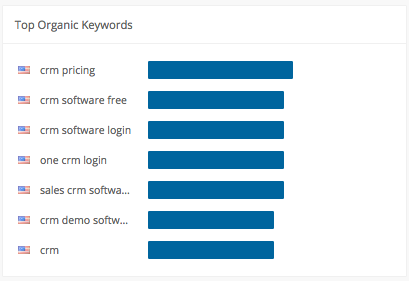 The Top Organic Keywords chart displays the top keywords among the companies you track. For example, if you track 10 companies and 7 of those companies rank for a particular keyword, this keyword would likely appear on the Top Organic Keywords chart. Why are some keywords in the Top Organic Keywords chart grayed out? The Organic Search Positions table displays all the keywords you are tracking as rows and the companies you track as columns. Each keyword is assigned a flag to differentiate the appropriate Google country domains. In the grid you can see the exact Google rank for each company and keyword. 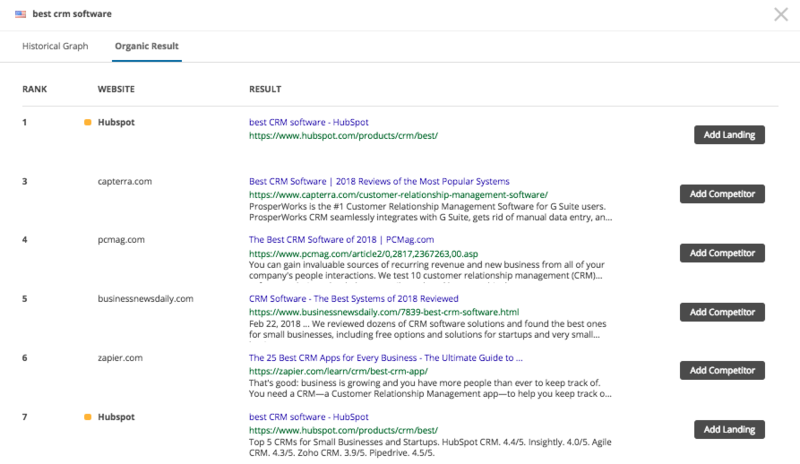 Kompyte includes a red down arrow for companies moving down in the SEO rank and a green up arrow for companies that have moved up in the past 24 hours. For more detail about the keyword tap the row, a pop-up appears with a Historical Graph & Organic Results. The Historical Graph shows any companies you are tracking that have ranked for the specified keyword in positions 1-100 in the past 30 days. The chart displays their daily evolution, this graph is most useful to determine the affects of your competitor’s website changes on their SEO ranking. 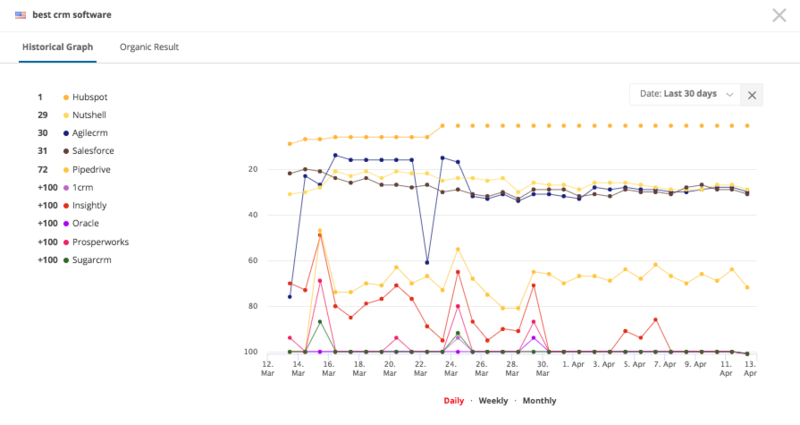 By default, the graph displays a 30 day range however, you can customize the view from the date drop-down on the right. What is Kompyte's Search Marketing Historical Graph? The Organic Results tab displays the current organic search results listed for the selected keyword. Kompyte shows all 10 of the first organic results, regardless of them being a company you track or not; along with the companies you track that have ranked for the specified keyword in positions 1-100 in the past 30 days. Notice the Title & Meta Description as well as the landing page of each result to optimize your SEO strategy. How can I change the country of a keyword I am tracking?